I met Sir Laurens van der Post, the author, philosopher and explorer five years before he died in 1996 at age 90. He became a friend and mentor. It turns out I was not privy to all aspects of who he was in his long life (see the introduction to Baboon in the Mirror in Richard’s Books) but even now so many of his words inspire and encourage me. The epigraph quoted on this site’s home page are such words for me. In particular when he says he lived his life not by conscious plan or prearranged design but as someone following the flight of a bird. These words of van der Post also describe my experience in a life that has led me from business journalism with the Financial Post, to financial analysis, money management and back to words as a poet and as a facilitator of poetry workshops and retreats. When I began to start writing poems again in my 50’s I never planned to do more than that. Life had different plans. Someone gave me a book called poemcrazy by Susan Wooldridge. I found a writing exercise there and decided to use it as a basis for a workshop during a family camp. Then a year later I was asked to do it again. I was astonished at how the words seemed to pour out of people – most who had never written a poem before. I wanted to lead more workshops but realized I needed to keep learning and reading! I began to attend poetry workshops in the US and Canada. Since then I have worked with poets including Li-Young Lee, Tim Lilburn, Julia Kasdorf, Dorianne Laux, Terrance Hayes, Tony Hoagland, Marie Howe, Jeanine Hathaway, John Fox, Scott Cairns, Paul Mariani, Heather McHugh, Margaret Gibson, Robert Hilles, B.H. (Pete) Fairchild, Marilyn Nelson, Ilya Kaminsky, Linda Gregg, Lorna Crozier and Patrick Lane. One of the most important influences for me has come from the books, CD’s and public appearances of David Whyte, a man who has done so much to introduce poetry to a world that doesn’t know it is starving for it. Whyte also showed me that the best poems are really road maps for a life well and fully lived; that they can inspire us to change and enrich our lives. Whyte’s work encouraged me to go beyond half-day workshops and lead weekend poetry retreats. There was more to come. Out of the blue, or so it seemed, a friend sent me an invitation for a weekend workshop led by poetry therapist John Fox . 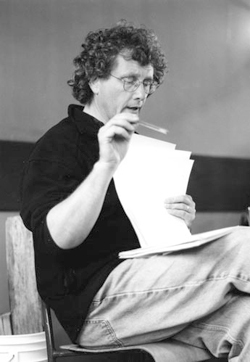 John, author of the workbooks Poetic Medicine and Finding What You Didn’t Lose, is a tireless workshop leader active in many countries around the world. His workshop confirmed how both hearing and writing poems can be a transformative and healing experience. A few months later a friend, who had attended one of my first workshops, invited me to her recovery centre to work with recovering addicts; to introduce them to the riches of poetry and to invite them to write their own poems. My work in recovery centres has shown me the dramatic healing power of poetry; how it can help people in recovery from addiction recover parts of themselves through their own words. It also brought me back to the writing of Patrick Lane, noted Canadian writer and teacher. Patrick has been my most important teacher through his workshops and on-line course during the past years but his experiences as an alcoholic and in recovery have enriched also my work with recovering addicts where I use his many of his poems as well as passages out of his award-winning memoir There Is A Season. His memoir is a searing one, told through flashbacks as he takes us through the seasons in his garden during his first year of recovery. My nonfiction writing was included in one of the volumes of the Morningside Papers written by the late Peter Gzowski, host of the nationally-broadcast Morningside radio program on CBC. I was a business columnist on Morningside for nine years. My poems have been accepted or published in the US and Canada in CV2, Antigonish Review, Alberta Views, Prairie Fire, island.writer MAGAZINE, The Other Journal and Ruminate Magazine. My poem Arrested was a finalist in the Malahat Review’s 2011 Open Season Awards. And two poems were finalists in 2017 Open Season Awards. I placed first in the Victoria Writers’ Society 2010 9th Annual Writing Competition for poetry adjudicated by the former Poet Laureate of Victoria, Carla Funk. I placed second in the 2009 CV2 Manuscript Contest and was a finalist in the Ruminate Magazine Janet McCabe poetry prize in 2008 adjudicated by American poet Luci Shaw. In October 2016 my first full-length poetry collection, Hyaena Season, was released by Quattro Books of Toronto. It is available for purchase on the Quattro website and Amazon.ca.